This was another beautiful day in NYC. I decided to venture in the east side of NYC since I hang out mostly on the west side. I have to admit that I had a hard time getting inspired to photograph. It was a nice day so I started walking south east starting from 57th street. I walked east towards 1st avenue and then headed south. I walked up to 14th street zig zagging between 1st and 3rd avenue. It was a first time that I didn’t take one photo of anything. I needed to be inspired so I though about heading north and I had an idea of taking the RI Tram from NYC to Roosevelt Island, I heard that it had a great view of the city so I decided to head back north. I got to the tram station and it turned out that it was still under renovation. I was really bummed out, I decided to keep heading east. Running along side the tram cables was Queensboro bridge (top photo). This was taken over a metal and concrete fence and right below it was FDR drive. It was kind of scary cause I had to climb up and take the photo over the metal fence, the fence was uninteresting so I didn’t want to include it in the photo. I think the photo turned out well, since it was a wide shot I had to fix a slight “keystoning” of the building in the background. I was kind of exhausted at this point so I started to head home and went through Central Park. The park was full of people enjoying the beautiful day playing baseball, sun bathing, picnicking and just hanging out. 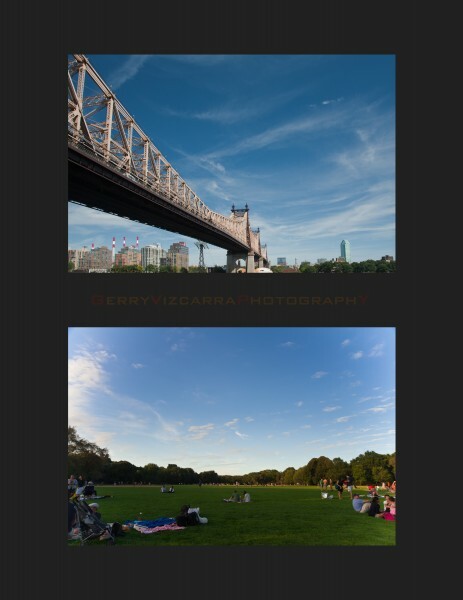 I walked across between Belvedere Castle and the Great Lawn. I was actually trying to photograph Belvedere Castle but it was kind blah, so I turned around took the bottom photo of the Great Lawn. I like this photo better than the photos of the castle since this had more dramatic colors, the sky, the green lawn, trees in the background and the people enjoying the day. This was late afternoon and the castle was side lit, it was not very interesting to me and the sky over the castle was just not there for me. The lesson for me this week was not to give up easily, have a plan B and C if plan A doesn’t work out and if a shot was not working remember to turn around and see what’s behind you. I hope you enjoy the photos and see you next week. Please leave comments, questions, and suggestions. I am going way back for this weeks post, this photos were taken early spring this year. 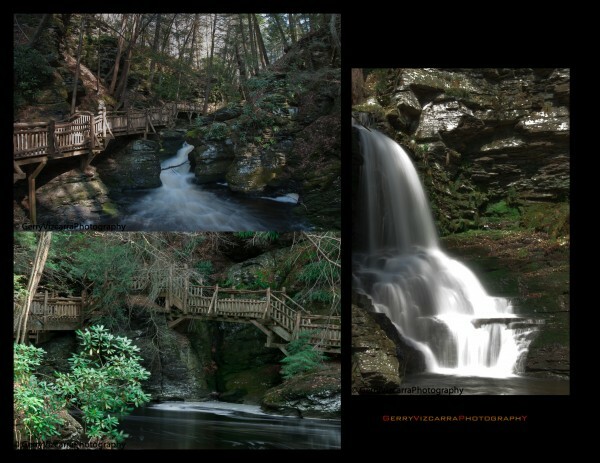 Bushkill Falls located in northeastern Pennsylvania around the Pocono mountain, very close to the Delaware Water Gap, was a great find. I have been here several years ago but didn’t get a chance to photograph it, however I made sure this time that I had my equipment with me. I was hoping to get there earlier that day but hit traffic on the way. It turned out to be a blessing since the park does not open till 9 am. It was a beautiful spring day. It was still early in the spring season, park still empty in the early morning hours, lush greenery, some flowers were in bloom, almost a perfect day to photograph. I love this falls because of those wooden walk ways built around the falls, it feels like your part of the environment and very close to mother nature. It’s also a wonderful hike around the falls and to the top of the mountain. I said almost a perfect day to photograph because at some point during the hike the sun was just too bright to photograph specially the different parts of the falls. I had lots of shot that my highlights were blown out, lots of “blinkies.” As you can see on my camera settings my aperture were in the high end to get that “flowy” look on the water movement. I didn’t have any ND filters handy which would work great in this kind of situation. However, I think the photos still worked out great. The lesson I learned here was to work with what I’ve got and create the best photo I can with the situation I’m presented with. Enjoy the photos and see you next week. Please leave comments, suggestions, questions or email me. Thanks for visiting. I went on a camping trip to Acadia National Park last May, it was also my first time in Mount Desert Island (MDI). I had a wonderful time, I woke up at the crack of dawn every morning to photograph and late returning to the camp site which was difficult because the campsite had no electricity therefore it was dark, difficult to get around. Overall I just had an awesome time there, the camp site wasn’t crowded, the trails were not crowded, although some of the trail were close still, and the weather was just beautiful. The first picture was taken on our third night at MDI. It was shot with a Panasonic LX3, a point and shoot camera. It had been raining all day and just after sunset the rain finally stopped and we were walking around downtown Bar Harbor and we saw this harbor at the end of the road and decided to check it out. 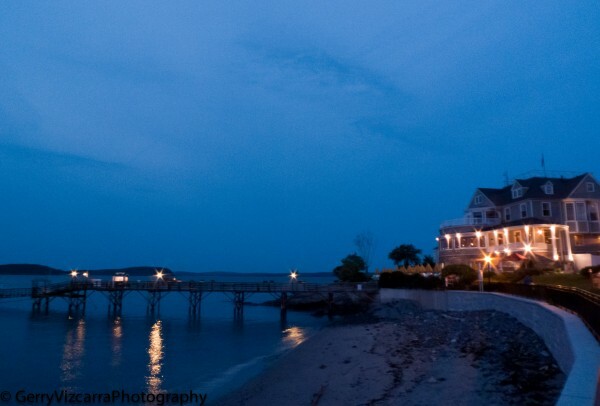 At the end of the road was Bar Harbor Inn. It was a beautiful night, the sky started to clear and just look at the blue sky that night. Even though that morning was a total washout because of the rain the evening still turned out spectacular. The lesson I learned here was, always have a camera handy even when you think the day was going to be a total washout. On the way home from Maine, we stopped by to see a friend in Bartlett, New Hampshire. He drove us around Mount Washington and on the other side of the mountain there was this castle like hotel called Mount Washington Hotel and Resort. It was another beautiful day to photograph, there were lots of cloud and the blue skies. If you look closer at Mount Washington peaks, there were still snow up there and our friend said that there were still people skiing at that time. 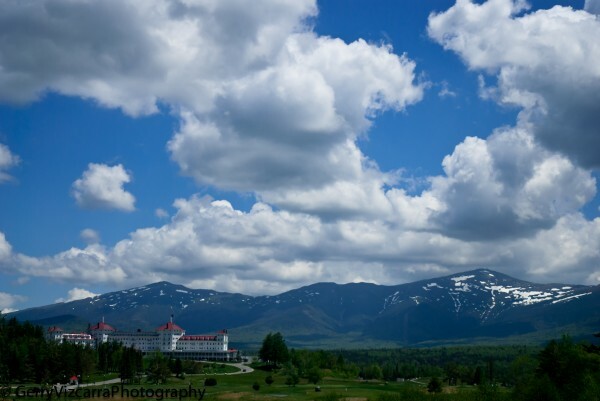 The last photo was taken from the back balcony of Mount Washington Hotel. This was the back yard of the hotel, what a awe inspiring back yard. 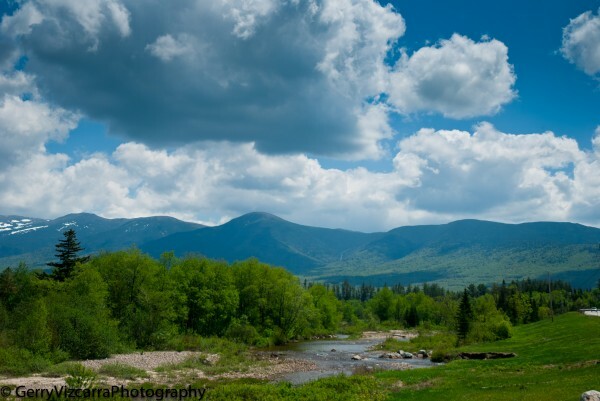 I like this photo because the stream or river on the foreground leads the viewer into Mount Washington, the blue skies and those puffy clouds. I had a wonderful time in this trip and awesome time photographing. I hope you like the photo as much as I love creating it. Please email me and/or leave comments, question, suggestions and constructive photo critique as usual. It was sweltering hot this past few weeks in NYC and there was a day that was kind of pleasant so I decided to take my camera and shoot. 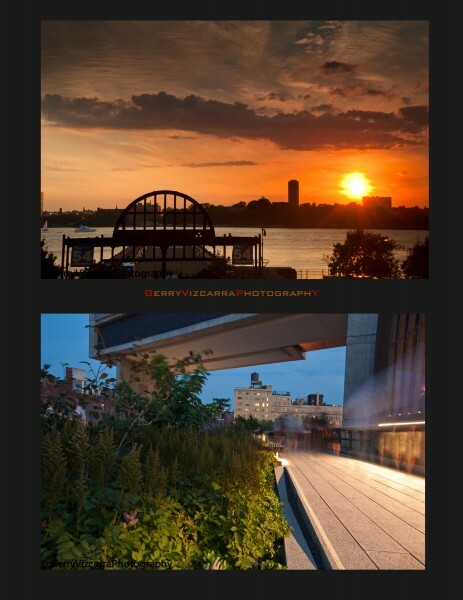 I have been to Highline Park in NYC’s Chelsea area more than a few times now and I have an idea of what I wanted to shoot. I have seen this view (top photo) of Pier 54 many times and photographed it during the day but I think this one had the most impact. The sun was about to set and the colors was just amazing. I wanted to use the structure for some type of framing but I think this one worked out ok.
For the second picture I wanted to focus on the actual park. The park was very beautiful, the flowers were in full bloom, lush greenery and lots of people enjoying the the cool breeze from the Hudson. I also wanted to try the high ISO on the camera, I heard all the rave about the ISO capabilities of the camera and I wanted to try it out for myself. I’m very happy with it and I think the picture came out great. If you have any questions please leave a comment or send me an email. I volunteer for a program called Puppies Behind Bars and we usually get a black Labrador Retriever one weekend a month. However, last weekend I was surprised to get a Golden Retriever named Perdy. The program sends out a write up about the dog so that volunteers have an idea about the demeanor of the dog. Perdy did not get a good write up so I was a little concerned. Perdy turned out to be a very loving, gentle and playful dog. For a 15 month old, Perdy was a big boy about 75 to 80 pounds. It was a scorcher in NYC last weekend so we mostly hanged out inside the house where it was cooler. Perdy was easy to photograph, he just kind of laid around and nap most of the time. For this photo I was trying to focus on the Perdy’s eyes and made sure that I have all his limbs and some tail in the picture. I maid sure that Perdy’s eyes were in focus and shot the photo from the floor or at the same height as Perdy. I shot with 50mm f/1.8 so it forced me to move my feet and my whole body. I do this exercise where I only use one focal length and shoot with it all day. All of my shots with Perdy was taken with the 50mm, which turned out great since we were indoors so the fast prime lens helped a lot. 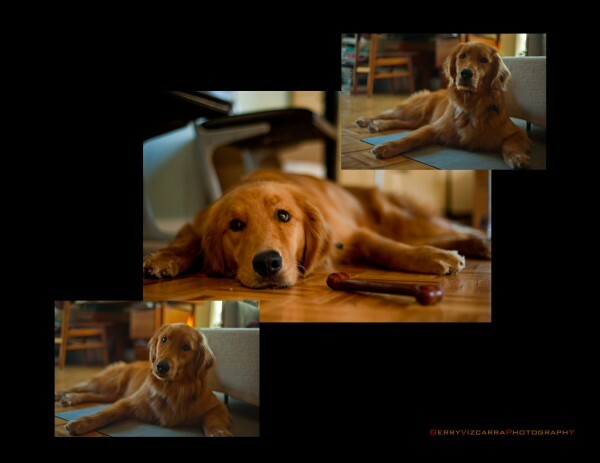 One thing I did differently with this post was I used Lightroom 3’s Print module to get this photos in one page. If you have any questions about the post please leave a comment or email me. As usual comments, suggestions, request and constructive photo critique are always welcome.